A long time ago I read the complete selection of Hemingway short stories. One of them had a main character named Tom Hudson. He mentioned in the story that he ate a lot of boiled leeks. I decided to try my hand at them. Both of us were extremely surprised by by the results. Very tasty indeed. Trim leaks and wash real well. Drop into boiling salted water. Boil for 10 to 15 minutes until white parts are tender. Remove from water and plunge into an ice water bath. Dry with paper towels, slice in half lengthwise. Make a dressing of 1/4 cup olive oil, 1 clove garlic pressed and 1 T red wine vinegar. 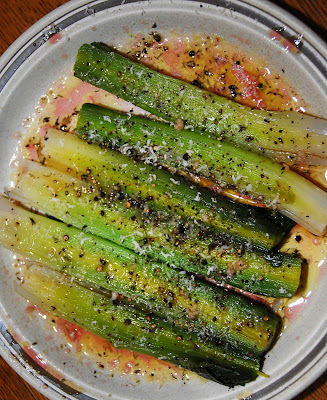 Sprinkle dressing over leeks. Sprinkle with fresh ground black pepper and freshly grated Parmesan. One thing you could do different is after slicing in half lengthwise, cut into bite sized pieces. Oh My gosh I'm so far behind on my blog. 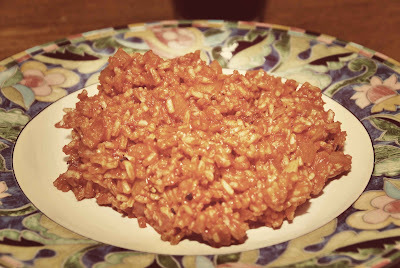 Last week I was looking for something tasty to make with my homemade bacon and I decided on Spanish Rice. Click on the link for the recipe. This and my mother's ham fried rice we some of the only meals I remember from Texas. I was very young at the time. The other meals I remember were associated with very bad memories and involved a stinky house and fish. This temperature is ridiculous. I forgot what it was like to live in a climate with below 0 temps. I decided to warm things up a bit with some Cuban food. 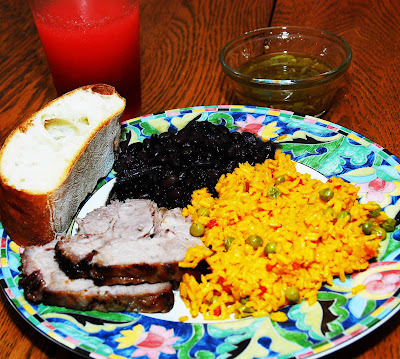 Here is a recipe for Cuban Pork Roast. What could make your kitchen smell better than roasting pork? Here is a tasty recipe for black beans. I also made some yellow rice...I Dutched it up a bit by adding peas, bacon, onion and pimento. Bring to a boil, cover, reduce heat and simmer until water absorbed. Remove from heat. Keep covered and let sit for about 10 minutes. Salt to taste. If you wish, you can serve with Rum Runners. 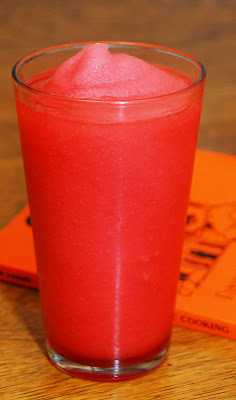 Blend above with ice until smooth. 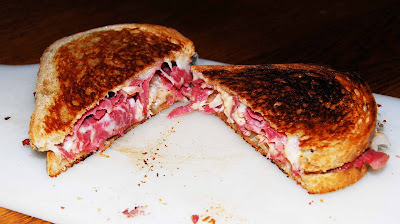 Some of my home cured corned beef made its way into Reuben sandwiches. 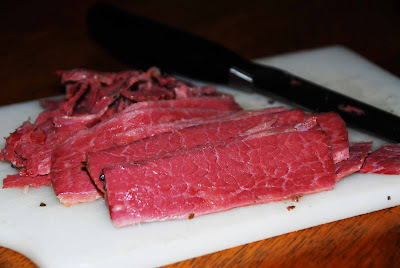 There just isn't anything quite like home cured corned beef. 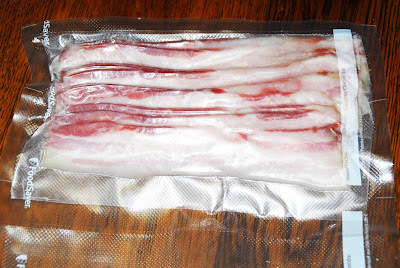 After a week of curing, its time to check your bacon packages. You have to squeeze each package. The bacon should feel firm, not squishy. If it is squishy it isn't done yet and it can remain in the cure for another 2 days. Mine was done at 7 days. The first thing you do is take the pork belly and wash it really well in cold water. Then you pat it dry with paper towels. Next you need to roast it on a rack in the oven. It can't be set right on the cookie sheet because it won't roast as evenly. 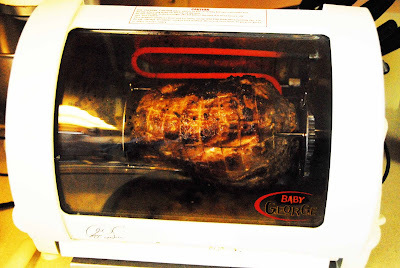 It is roasted at 200 degrees for about 2 hours or until the temperature of the meat measures 150. It is very important to roast it at the right temperature to 150 degrees. Once it is done, take it out of the oven and cool it in the fridge. For processing, cut the layer of skin off using a very sharp knife. Then cut the meat into bacon strips. The strips can then be vacuum packed and frozen. Don't waste anything. The little ends that can't be cut into strips can be cut up into bacon bits. I have a lot of recipes that call for crumbled bacon. These little bits will be perfect. Besides, this makes extraordinary bacon and you will kick yourself later if you throw anything out. Home cured bacon is like homemade butter. You just can't get that flavor anywhere else. 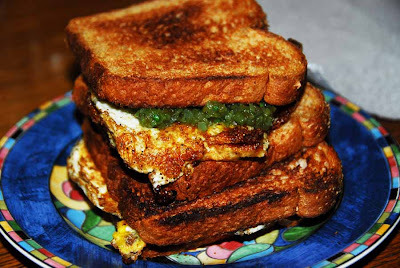 Shown on the sandwich is my favorite on a fried egg sandwich: Picklelilly! My corned beef finished its beefing. For the Outback Bowl I went over to Easy E and NJ's house. 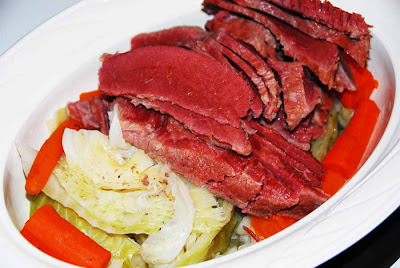 We had a nice dinner of corned beef and cabbage. Its pretty easy so E liked it. 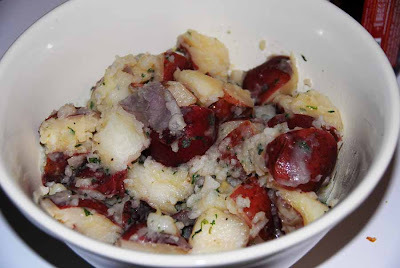 I never had this particular dish growing up but we had a version of it made with ham called New England Boiled Dinner. Cover your corned beef with water in a big pot. Cut a carrot up into big chunks and toss in the pot. Bring to a boil, reduce heat, cover, and simmer 1 hour. Meanwhile quarter some red potatoes. Drop them in when the hour boil is up. Cut up a head of cabbage into wedges. After the potatoes have boiled 15 minutes put the cabbage on top. Simmer, covered until cabbage is nice and tender. Remove cabbage and place into a serving dish with the carrot. Top with sliced corned beef. Place the potatoes in another bowl. Drop in a stick of melted butter. Add a little parsley and some garlic salt and stir. Serve it up nice and hot. 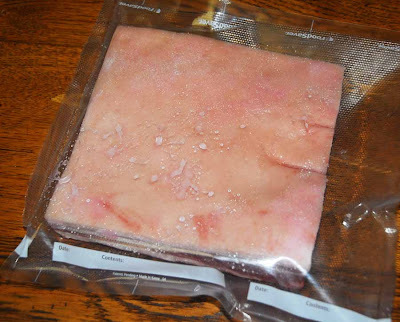 I bought a whole raw pork belly from the Niman Ranch. It has quite an interesting history, but the long and short of it is that it is a cooperative of family farms. 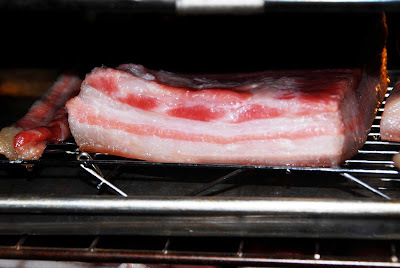 I got the idea and instructions for making bacon from the book Charcuterie: The Craft of Salting, Smoking, and Curing. You need 2 things that you might not have on hand if you want to make your own bacon - pink salt and a hog belly. I could not find any butchers locally who could order me a hog belly so I was out of luck there. The Niman Ranch is probably the next best thing, as the pigs come from family farms, many of them in Iowa. One farm in Iowa is famous for letting the pigs tear around and chase each other. They have huge wallows and sit in there all day making a big stink. I hope my hog belly came from that farm. The pink salt you can buy from Sausagemaker.com under the name instacure 1. To cure the bacon pour a little of the dry cure onto a cookie sheet. 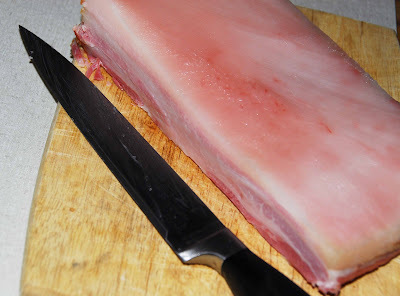 You will have to cut your pork belly into pieces with nice square ends. Don't throw away the trimmings. Those can be made into lardons for braising. 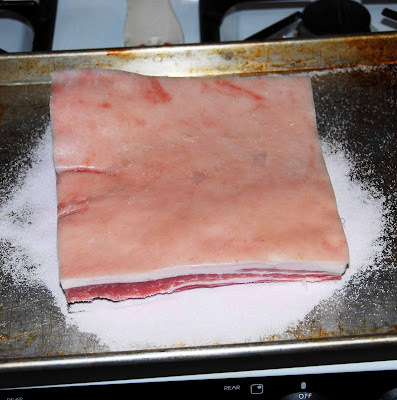 Plop the piece of pork belly down into the salt and coat all sides. Next package it in ziplock bags or in foodsaver bags. Put it in the fridge for at least 7 days. This time of year is great because I can put it in the garage and it is the perfect temperature. You're supposed to turn it over every now and again to redistribute the juices. At 7 days you're supposed to poke the hog belly with a finger. If it isn't firm you need to let it sit longer. I'll post again with the next steps.